One of the core strategies for portfolio diversification is increasing exposure to international stocks and bonds. This risk reduction strategy is easy to achieve, yet the value of this asset class diversification has diminished over the last few years. The financial cycle has more commonality as measured through times series analysis, and it is harder to achieve the diversification benefits desired if there are more correlated financial cycles. There are a host of reason for this increase in financial cycle correlation, but no one explanation can do the job even after accounting for the Financial Crisis. 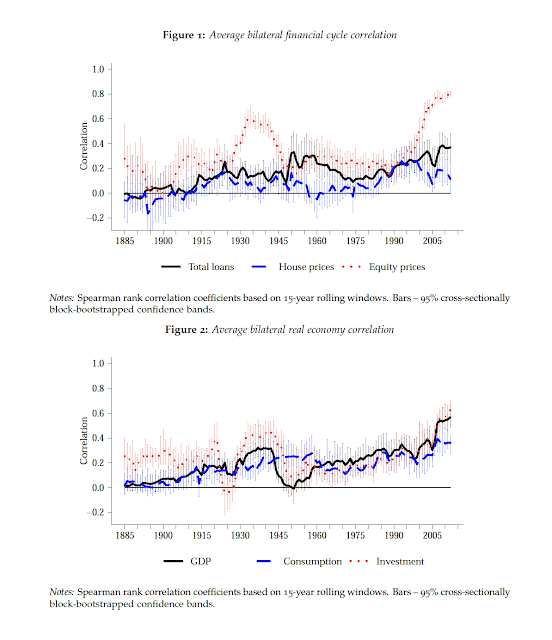 There is a real economic reason for the higher financial correlation; bilateral GDP's are also increasing, but that does not nearly explain the more explosive increase in equity price bilateral correlations. There are structural reasons for bilateral correlation changes given the lower capital control, increased capital flows, and greater economic integration. However, most important may be the tighter financial links across countries between US monetary policy and global risk appetites. The paper, "Global Financial Cycles and Risk Premiums", provides a wealth of empirical information on this important topic. 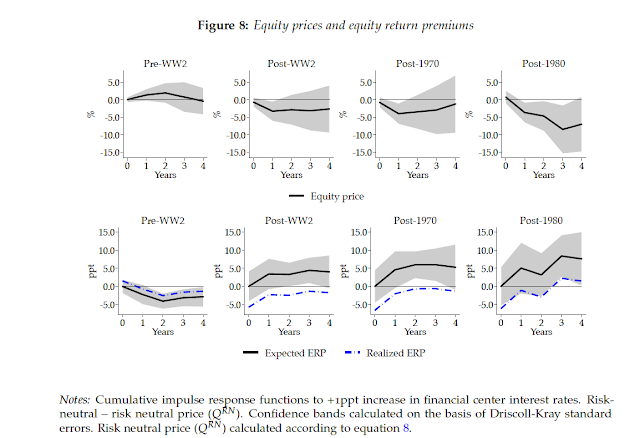 It shows a clear change in the response equity premiums to an interest rate shock over the last few decades. If this work is true, we should see equity price declines with the Fed's higher rate policy. Holding risky asset abroad will not provide safety as global risk appetites change with monetary policy tightening. Investors will have to look harder for diversification in their portfolios. The Overton Window is called the window of discourse for any range of ideas. It has mostly been used to describe differences in political discussions. Extreme views will be unacceptable, but as they are either adjusted or gain traction, there is a window of acceptance or common ground between extremes. The viability of any idea is determined by whether it falls into the window between extremes. Any idea is constrained if it falls out side the window. 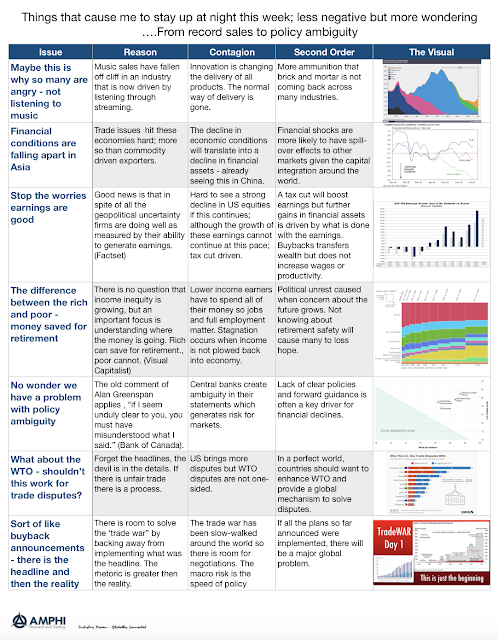 The Overton Window can be used to describe the development of ideas in finance. For example, market efficiency or inefficiency could have been viewed as extremes along a spectrum, but now there is an acceptance of a middle ground. Market efficiency was at first unthinkable or thought of as radical in the early 1960's only to become the acceptable wisdom of the 70's and 80's. During the height of the efficiency market paradigm, ideas of behavioral bias were considered radical and not sensible. They were outside the Overton Window of what was popular and hence not employed by investment managers. The extremes are not accepted but there can a middle ground for market efficiency. Investors now usually accept that there are market inefficiencies but they are hard to find and not easy to exploit. A new idea may move from unthinkable to radical and then onto sensible over time. The idea that behavioral finance could be useful or supplant market efficiency was viewed as something unthinkable in the early 80's. Then it was viewed as a radical approach by some research extremists. It then became acceptable and sensible. We can now say that it falls between sensible and popular. The process of any ideas acceptance takes time and requires advocates that will be outside the Overton Window to face ridicule while the idea gains traction. Another simple idea where there has been a movement of the Overton Window is momentum risk premium. A trend follower in the '80 and '90s, was considered to be out in the financial wilderness. 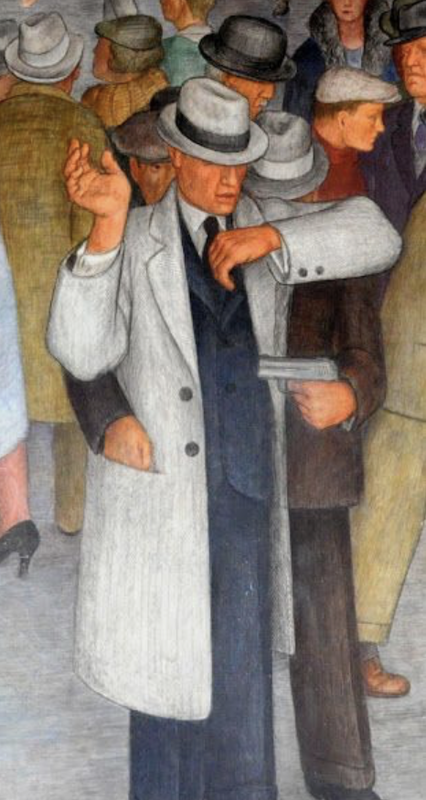 Trend followers were like barbarians at the edge of financial theory civilization - they engaged in unacceptable behavior and needed to be kept at arms length. Now, momentum is viewed as one of the core risk premiums available to investors. 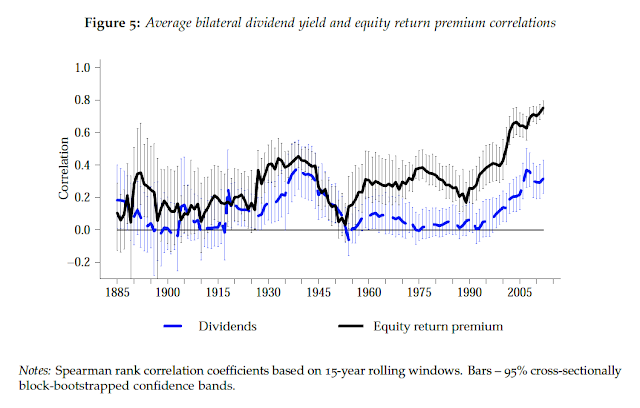 Trend followers have moved from being outsiders to core exploiters of a fundamental risk premium. With a change in attitudes about core financial concepts, trend followers clean up nicely. Given that the acceptance of ideas change through time as new evidence is presented, we should be less skeptical of new ideas and more skeptical of conventional views. New is not always better, but new should not be feared. Complacency with idea generation should be feared. Paul Saffo is a specialist in forecasting and has been working and teaching in this area for decades; however, my exposure to his thinking is recent. This simple heuristic is a very interesting concept of how to deal with any investment issues. Be bold, do not be "squishy" about your opinions, but be willing to change upon seeing new evidence or a better argument. Only through having strong arguments can you tear them apart and find something better. Weak opinions will lead to weak alternatives. There can be a lot of investment talk, but is it being translated to a strong opinion and subjected to close analysis? Take a simple example, the potential inversion of the yield curve. If the inversion argument is true, then you should have some strong opinions on what to do with your portfolio. Period. No waffling. Now, what are the counterarguments for not holding this strong opinion? If you have convincing evidence that your strong opinion should not lead to action, stop and move to a new hypothesis or argument. How many investment policy meetings include lots of discussion and limited action? Most participants will say something like "I feel" or "I think" but few will say, "The evidence I see says we should do X, prove me wrong, otherwise we should act." Put a line in the sand and ask to be proved wrong. If new evidence is presented, change your mind. Perhaps the true power of quant investing is a strong opinion. If those opinions prove consistently false upon testing, a quant will accept that there has to be change. The bane of investment management is not making the wrong decision, but not making any decision because we have weak opinions, strongly held. Mistakes were made. Mistakes will be made. Sorry, I made a mistake. Many think that an apology for mistakes is all forgiving. But the definition or type of mistake makes all the difference. Don't make them on purpose. What is a purposeful mistake? An action that could have been avoided with a minimum of effort or should have been known to be a mistake in advance is a purposeful mistake. Action that may result in failure but sized correctly by probabilities are not mistakes. If there is an 80% chance of being sunny and it rains, this, by itself, is not a mistake. It was a calculated bet that had an unfavorable. Hearing that there is a 100% chance of rain tomorrow and you don't bring an umbrella is a clear mistake. If you knew the odds, but did not act appropriately, it was a purposeful mistake. If risk is the chance of loss times the size of a bet, then mistakes, at a high level, can be divided into two parts. There could be a mistake with the probability of the risky event, or a mistake with the sizing of the bet. Investors cannot immediately determine the type of mistake with any probability of an event. There needs to be a large enough sample to determine if forecasts are biased. 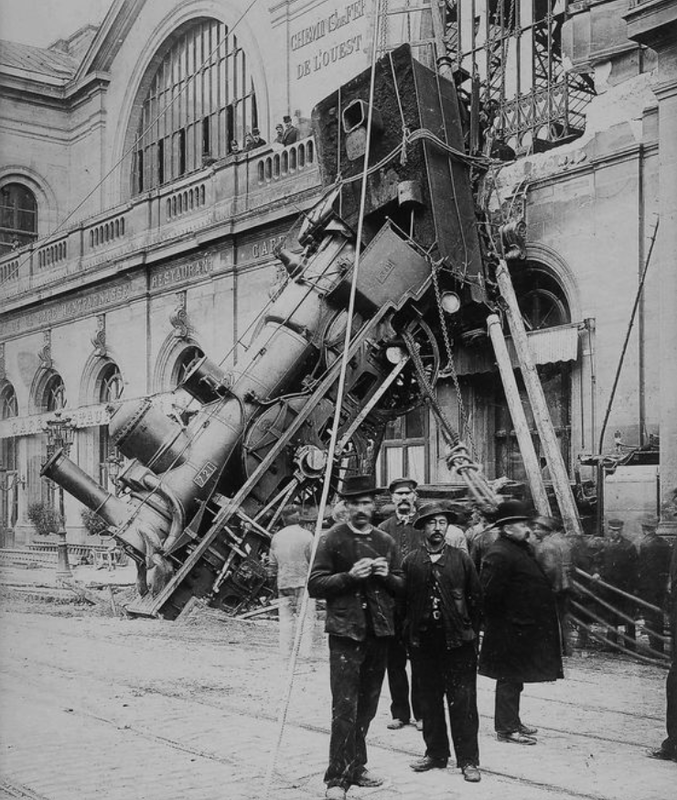 A repeated bias in probability assessments of an event without any adjustment is a purposeful mistake. Your forecasts are systematically wrong and you have not adjusted. This is a purposeful mistake. The size of the risk taken, however, can be measured and looked at immediately. A sized bet that will cause significant financial harm could be viewed as a purposeful mistake. While we can wait for the harm to be realized, an oversized bet if wrong can have immediate ramifications. Not gathering information to make a decision is another purposeful mistake. Using the weather example, if you are planning a sailing trip and you don't check the weather, it is a purposeful mistake. Being subjected to a surprise storm is not a purposeful mistake. Ignorance is a purposeful mistake. Spent your time on "what is" not "what if"
Spend your time on "what is" not "what if". I picked up the phrase from The 10 Pillars of Wealth by Alex Becker. It seems apt given many recent discussions on the global economic environment. I am a strong believer in scenario analysis and have talked about scenarios as good tools even for trend-followers to assess potential risks, yet there is a hidden or implicit assumption that is more important for any financial discussion - what is the current environment. 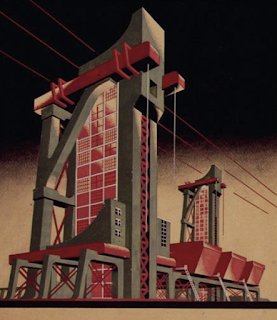 I have found that many cannot agree on what is the current economic environment so any discussion on what the future may hold is likely to be suspect. Answer the simple question first, "Where are we?" before you go onto the next question, "Where are we going?". Investors diversify simply because they are not sure of three things: what is the economic environment, where it is going, and what is the link between growth and financial asset pricing. Investors would not need diversification if they are certain on these three things. The first job of investors is not prediction but proper description. A description of the environment is not a data dump of current facts, but simpler. 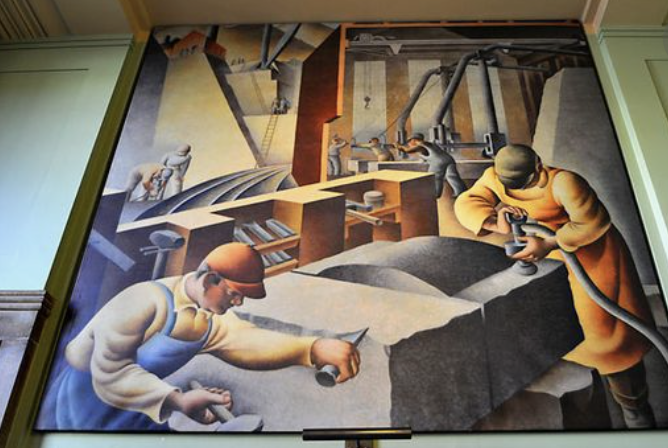 Is the economic environment growing or not? Is it accelerating or is momentum slowing? Certainly many market analysts spend time telling investors what is the latest news, but that is not the same as defining the current environment. In the simplest case, the environment can be rationalized by a few key states or variables, growth or no growth, increasing or decreasing liquidity, and risk-on or risk-off. Determining the state of the environment is not the same as describing the latest economic data. Data without context does not tell us much. The economic growth state does not change that often so following any day or week surprises will not likely change the economic environment. Worry about the current economic state of the world and then determine the scenarios that will get you to the next state. Scenarios for tomorrow will be deeply affected by the state of today. Scenario Analysis for Systematic Managers? Absolutely! 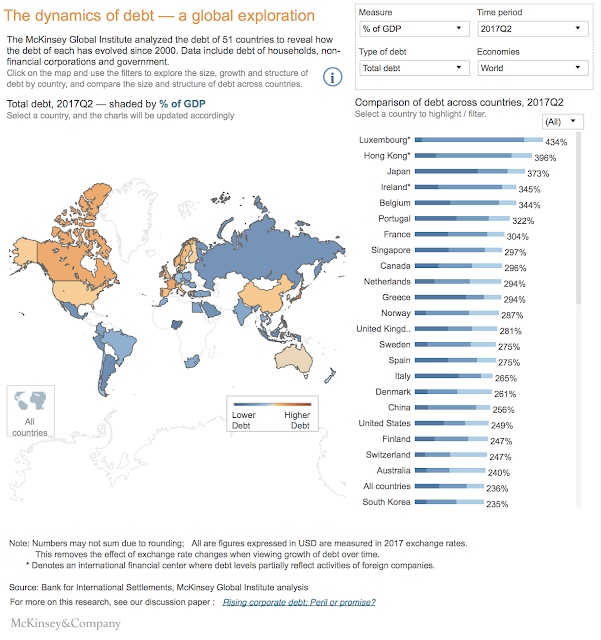 The McKinsey Global Institute published a new report, Rising Corporate Debt: Peril or Promise?, that is good reading for anyone focused on global debt issues. The charts and tables provide a wealth of data. With respect to current debt growth, I always think of the quote from the economist Herb Stein, "If something cannot go on forever, it will stop". The investment question is determining when the music will stop for debt growth and what will be the spillover effects on financial markets. The impact will be negative. It is juts not clear how bad it will be. The McKinsey thought piece focuses on four major areas of change in global debt markets over the last decade beyond its sizable growth. Geography - The growth of EM debt has out stripped the growth in DM markets even after accounting for the explosive growth in China. Much of this debt is dollar-denominated. Type - The growth in debt by non-financial corporation have outstripped the debt financing by governments. Corporation found an opportunity to obtain cheap money and they took it all over the world. Structure - Non-financial corporations jettisoned financing from banks to tap bond markets. With less stringent bond covenants, they have exploited the more anonymous debt markets. Risks - Lowered rated corporations (BBB) were the main users of debt markets at the tighter spread levels. However, there is going to be a flood of refinancing over the next few years which will have to be financed at higher rates. The EBITDA coverage of interest payments is relatively low, 1.5 or lower, so higher rates will impact the ability of firms to repay. 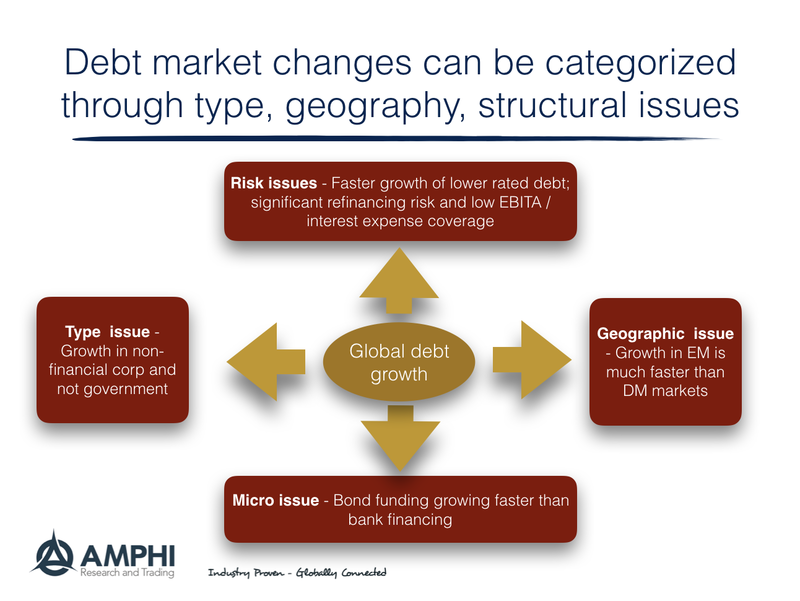 The combination of type, geography, structure, and risks make for a volatile market environment if there is reversal of the positive debt environment. Short yields are now higher than dividend yields. Growth stocks continue to outperform value. The yield curve continues its slow flattening march. EM stocks are diverging from developed markets. Wealth as measured by equity market cap is falling. An increasing number of firms are losing money. Copper prices signal an economic slowdown. Global PMI, albeit still above 50 is moving lower. Dislocations offer opportunities for exploiting trends or betting against the herd wisdom. This will not happen if markets are range-bound. Dislocations are attention focusers. These are the places I will be spending my research time. "...for it is a recognized characteristics of money as a store of wealth that it is barren; whereas practically every other form of storing wealth yields some interest or profit. Why should anyone outside a lunatic asylum wish to use money as a store of wealth. Because, partly on reasonable and partly on instinctive grounds, our desire to hold money as a store of wealth is a barometer of the degree of our distrust of our own calculation and conventions concerning the future." Money is not a store of value but a claim on value. 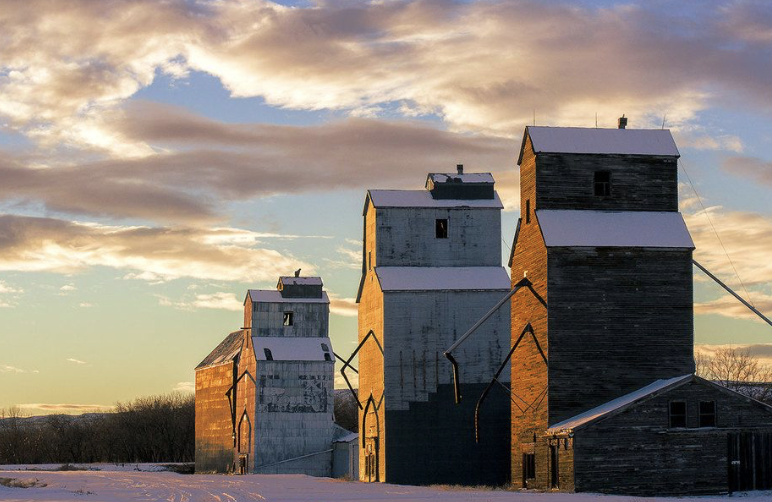 As rates start to move higher, it is important to go back to basics on what is the value of money and whether it should be used a store of value. In a zero or negative interest rate environment, holding money is a good rational strategy, but times are changing especially in the US. This is not the case in the EMU where short rates are still negative and holding cash makes sense. There was a significant search for yield given the absolute level of rates as investment substitutes. That search for yield involved taking more risk. Now there should be a search for alternative stores of value through moving out of currency and demand deposits for near cash. With inflation higher, the cost of money as a store of value increases. The change in money stock will slow given the change in portfolio balances. However, care is needed to find the right store of value. Moving too far out the curve in the credit area has been costly given the widening in spread in corporate bonds. Floaters still face spread risk. 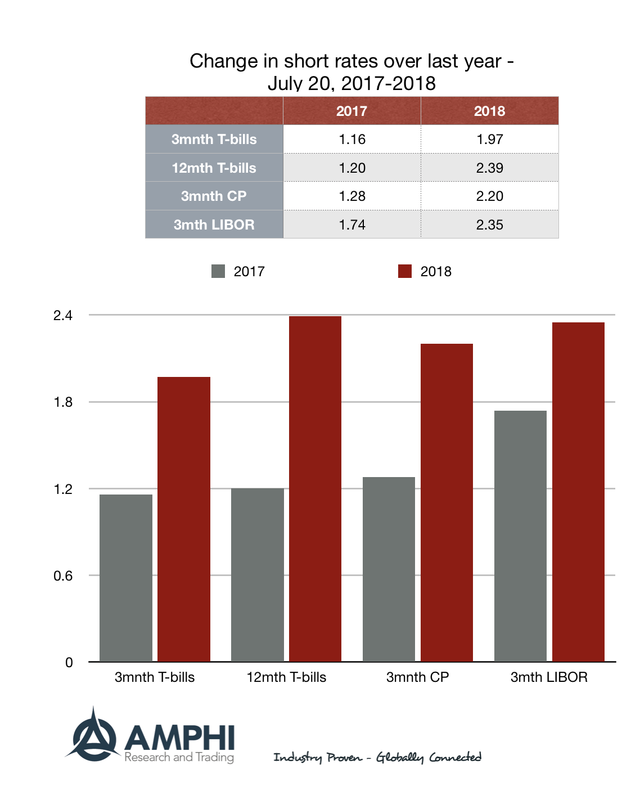 Short-term Treasuries and agency paper are still a go to choice 2% percent yields; nevertheless, there are some short-term corporate paper that offer better yields. The only reason not to hold these yield instruments is if you have a wildly high aversion to risk or you believe there is so much uncertainty that even 3-month yields cannot be trusted. That is not the case so money should be moved out of cash regardless of any current financial asset uncertainty. I am concerned about tariffs. They are strong effects on importers and exporters in industries affected by tariffs and we don't really know how tariffs will impact the supply chain and logistics for many companies. 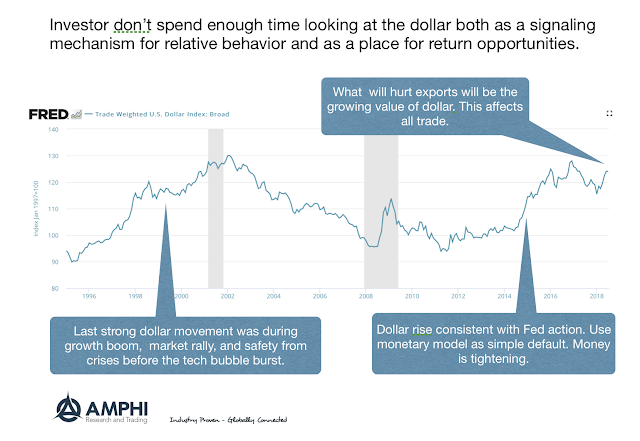 Nevertheless, the strong dollar will have a bigger impact on US exporters across the board. Higher economic growth and deficits. Structural reasons for return of capital to US. Dollar hedging from dollar borrowers. The dollar is signaling what is happening around global markets. It may have been awhile, but more investors should get back into the habit of following currencies. 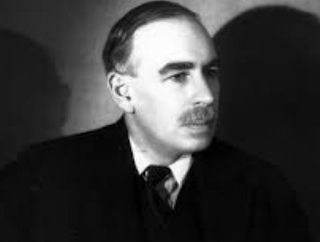 ... a good mathematical theorem dealing with economic hypotheses was very unlikely to be good economics; and I went more and more on the rules. 2. Keep to them till you have done. 6. If you can't succeed in 4, burn 3, This last I did often. Even though he was speaking more than a century ago, Marshall provides useful advice from one of the great economist of all time. All models, including econometric ones with empirical results, should be able to be translated into plain English. There should be a simple narrative associated with the model and there should be examples that others can use to explain or describe the results. If you cannot tell an effective narrative using the model, then go back to the model and try again. The magic in models is their ability to compact a lot of information in statements where there should be limited ambiguity. It is a shorthand language that can provide concise intuition about a specific problem. The magic of narrative in translating this concise representation into useful stories that can explain the existing environment and tell us something about what may happen in the future. Narratives don't have to be compact or use a shorthand language. Narratives are the descriptive real world examples and need to be truthful. A model that cannot lead to a truthful narrative that represents the facts fails. There are useful models in finance, but there are also ones that steer us in the wrong direction because they do not fit reality. A key job of the investment professional is knowing which ones work and which ones are suspect. 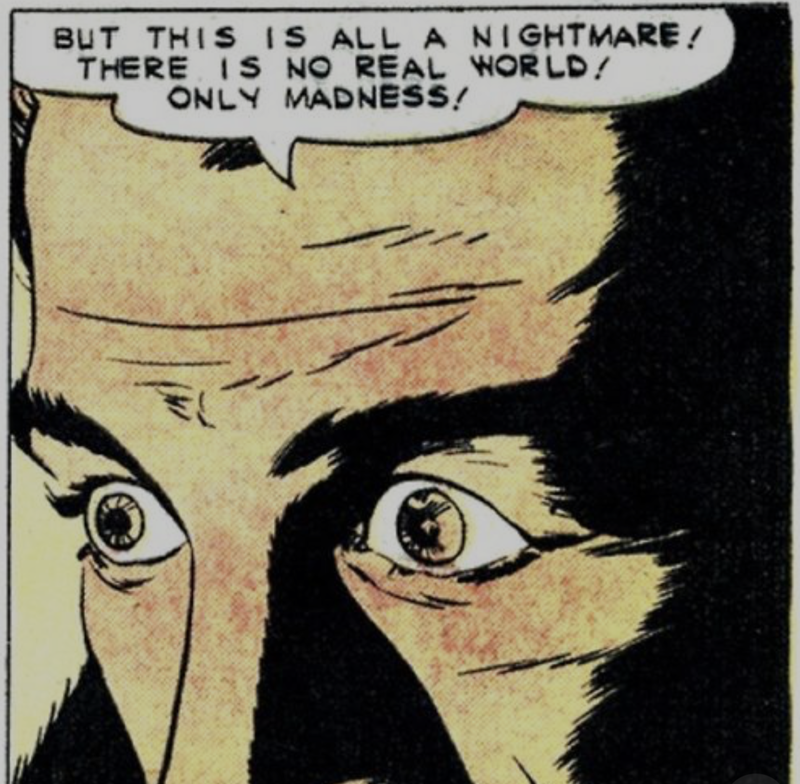 I have written about Sherman Kent for years as someone who grappled with uncertainty and the language we use to discuss it. There is imprecision in the words we use such a "likely" and "probable". Sherman Kent was a professor at Yale University who was called in to co-head the CIA's National Office of Estimates and improve their forecasting skill. Getting the chance of a bad event wrong has real effects. During his tenure, Kent wrote an important piece on the use of ambiguous words to describe our probable estimates. He worked to end squishy vague language that provided political cover for assessment authors. It now looks like Sherman is getting his due with a recent article in the Harvard Business Review, "If You Say Something Is “Likely,” How Likely Do People Think It Is?" The authors of the HBR piece extended the sample used by Kent to show the attached probability for words. While many may agree on relative probity weights, there is vagueness in language and that has not changed over the last few decades. If you don't believe me you can take a survey and see how your assessment of probabilities associated with words differs from others. 3. Don't use words when numbers are needed. 4. Precision through probabilities will not solve forecasting errors but will eliminate ambiguity. 5. Quantitative thinking is more running statistical models - It is about learning to be systematic and precise in decision-making. (d) the development of downright fraud, imposing on a public which has grown credulous and gullible. There are two sides to every debt story. Firms, governments, and households have been borrowing more. The size of debt is significantly larger than what was seen at the end of 2008. 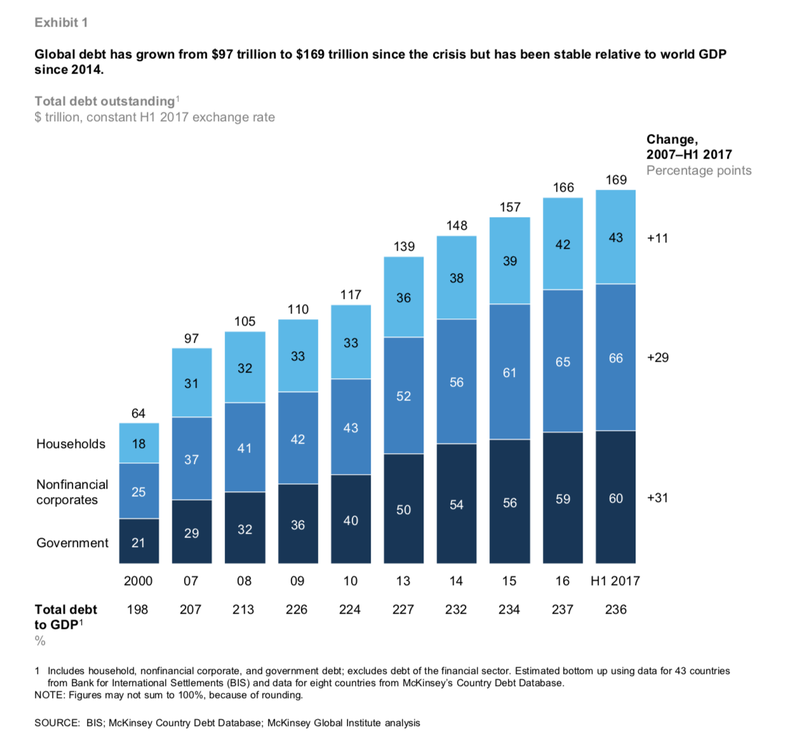 The debt to GDP globally has increased over the same time period. These borrowers believe that their ability to pay back their debt will be the same or better in the future. Debt has been used to buy other assets under the hopes that they will increase in future value to pay the principle. If this optimistic future does not arise, future growth will be impeded. On the other side, lenders have extended funds to borrowers under the optimistic hope that their reach for yield will continue to increase their wealth. Many have been talking about the debt deflation theory of Fisher for years as the debt levels rose over the last 10 years. It was supposed to be coming, but never materialized. Now we have inflation, so many will think the debt-deflation scenario cannot happen. We will inflate our way out of this problem. Unfortunately, while higher inflation may help all borrowers, the complexities for any given borrower increases. The nominal rates are rising and real rate of interest may be increasing. Foreign debt denominated in dollars is becoming more expensive. Refinancing has to be done at higher rates for firms that may not have control over prices received. Inflation while defined as a general price increase may be higher variables at the local level. The uncertainty of higher nominal and real rates, variable inflation, currency changes, and variable growth all contribute to a change in the optimism that caused more borrowing. A change in these expectations will rob current borrowers of refinancing and rob lenders of a chance to see a return of the funds. 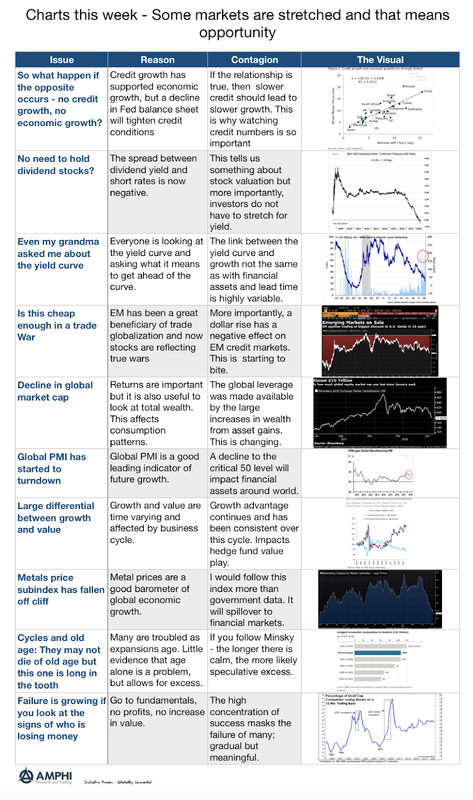 Financial assets will deflate, wealth will decline, and future growth slowed. Correlation is not causality. Blending two variables on the same graph does not make a relationship, but there is a core link with the relationship between real and financial assets. Financial assets are related to the future ability of issuers to generate cash flows for dividends or for paying down debt. Growth in real assets are linked to the demand for resources to sustain current and future consumption. 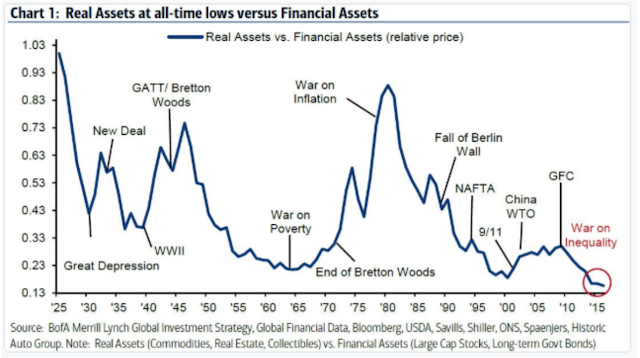 Financial assets are at all time highs versus what is considered real assets; commodities, real estates and collectibles. Real assets usually exploded in relative value during periods of inflation and war when more resources are needed or when commodities are scarce relative to money. The flow of money has moved to financial assets especially those that are related to technologies that do not need capital. The flow of excess money to financial assets and their expected future cash flows exceed demand for real assets that do not immediately generate return but have to be transformed for consumption or usage. This imbalance is unlikely to continue unless we place continued value on services and intangibles that do not need real assets. We are not suggesting that the ratio should flip but any sense of scarcity for real assets or lower demand for assets with the promised of future gains should increase the relative price. 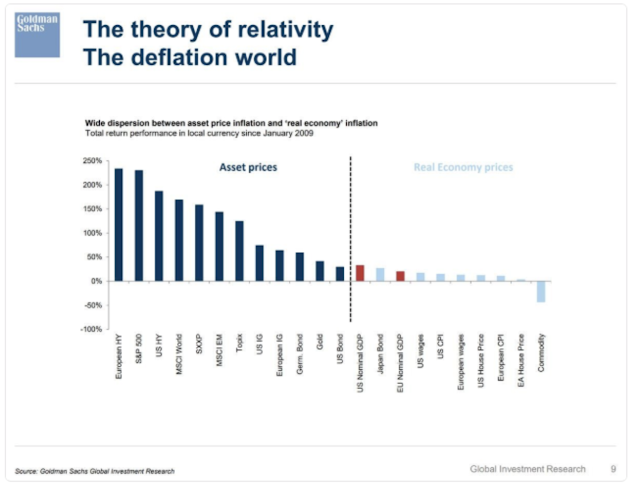 Another way to see this is through comparing asset price inflation and real economy inflation. Real prices have not moved and in the case of commodities have fallen. Financial assets have exploded. The capital gains, dividends, or carry has favored these assets over investing in the real economy. Excess cash has used financial assets as a store of value. This is the collateral used for a levered economy. 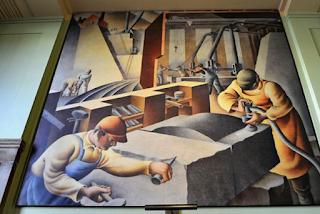 This does not mean that investors should place a big trade in commodities, real estate, or companies more closely aligned with the real economy. However, the strategic allocations to real assets that have been under-represented by many pension funds should be topped off. This change in allocation will allow investors to exploit any long-term mean-reversion between financial and real assets. I have fewer concerns this week; however, there is significant risk with inflation. Inflation is growing around the world. We are pass 2% in the US by any number of measures. Let the overshoot begin. There is little reason so see the Fed changing their behavior and there is a stronger case for further money reduction around the world. The trade rhetoric is still high and there is general agreement that further trade action will slow growth, yet we continue to move down this path. Nevertheless, good earnings can still make investors happy regardless of the macro environment. I have focused on a number of other issues that caught my attention from music sales, retirement, and central bank language ambiguity. I have just finished reading the wonderful biography of Leonard da Vinci by Walter Isaacson. 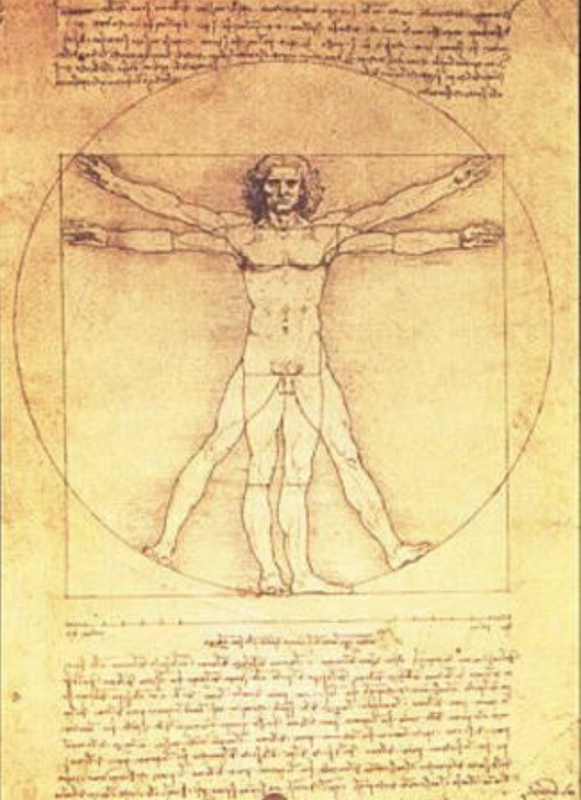 Isaacson makes da Vinci accessible as a person. HIs description really struck me. 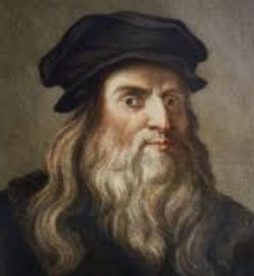 Da Vinci should not be placed on a pedestal of genius. He had a humble beginning. He did not have the schooling that others received during the period. What he did have was relentless curiosity. If you look at his notebooks or his art you will see his incredible power of observation and a mind that was not limited by conventionality. "His genius was of a type we can understand, even take lessons from. It is based on skills we can aspire to improve in ourselves, such as curiosity and intense observation. He had an imagination so excitable that it flirted with the edges of fantasy, which is also something we can try to preserve in ourselves and indulge in our children. ...Skill without imagination is barren. Leonardo knew how to marry observation and imagination, which made him history's consummate innovator." This same demanding curiosity is within our own grasp. 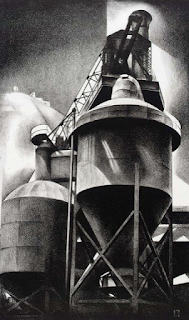 This search for core answers and shadings of grey is the standard investment business problem, so a demanding curiosity should be applied to all of our investment thinking. It is not easy and requires significant concentration, but most investors can up their game. We have tried to internalize this thinking with our comment on Toyota and his five-why standard; The five "whys" and investment management - Finding the root cause. Just continually ask why numerous times until you get a deep answer. Curiosity is not something that comes naturally to most investors. It is also hard work and there is more than one type. See, Curiosity - There is more than one type and hedge fund managers need them all. Investors should train themselves to be more curious especially about the obvious. Accepting some facts or rules of thumb as truism through not being curious enough has caused significant drag on investor performance. 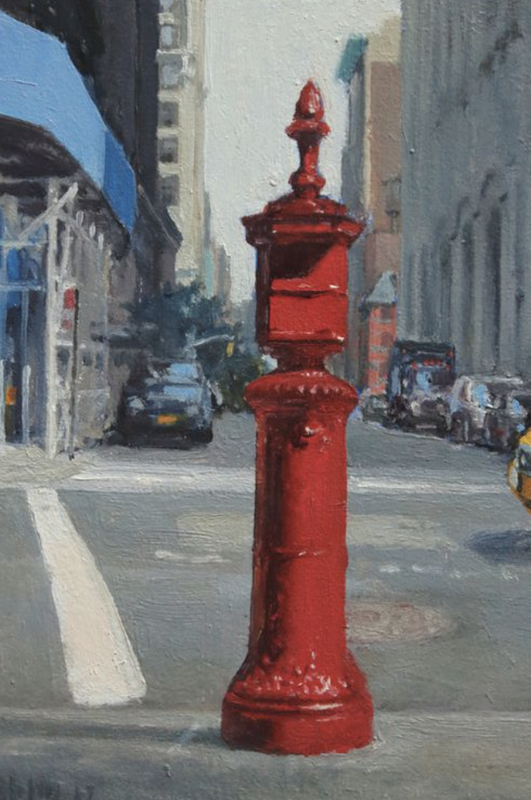 The power of observation is critical in a nearly efficient market. Managers are all seeing the same data, so investor skill is with observing something different or generating a fresh perspective in what many have seen before. See, Teaching cops to observe - Investors could use some help here. We cannot all be Leonardo. Still, there is a significant room for improvement for most by breaking down the details of a quantitative model or conducting a deeper due diligence on manager skill. It can be as simple as not accepting the "facts" as presented by researchers or talking heads. 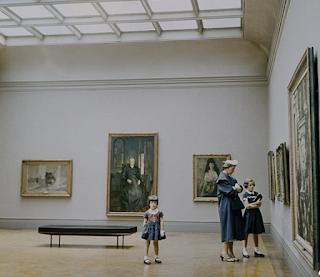 Curiosity and observation skills do not have to be earned through an advanced degree. It can be achieved everyday through trained focus. Can anyone who has technical knowledge become a good money manager? This is a fundamental question for the quant revolution. Ask many quants and the answer will be yes. At the extreme, the quant does not need to have any specialized knowledge of the underlying markets or names of the assets to be traded. Of course, there needs to be knowledge of the rules of the game, but nothing beyond that. Technical knowledge is supreme and trumps any of the practitioners in money management. There are others who would say that technical knowledge is not enough. There is also something called practical knowledge that is as important. Practical knowledge is learned through practice, tradition, and mastered through an apprentice. Practical knowledge is what cannot be taught through reading a book. Think of cooking as a simple example. You can get all of the technical knowledge you want from cookbooks. There will be recipes and outlines of all of the steps. There will be a complete list of ingredients and pictures of what the meal should look like. There may even be instructions on how to prepare all of the ingredients. Unfortunately, as most will know, there is a big difference between this technical knowledge and the practical knowledge of cooking. Every science, every art, every practical activity requiring skill of any sort, indeed every human activity whatsoever, involves knowledge. 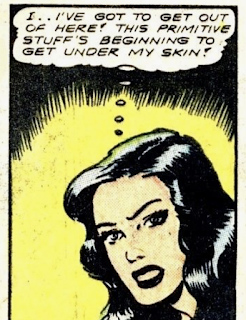 And, universally, this knowledge is of two sorts, both of which are always involved in any actual activity... The first sort of knowledge I will call technical knowledge or knowledge of technique. In every art and science, and in every practical activity, a technique is involved. In many activities this technical knowledge is formulated into rules which are, or may be, deliberately learned, remembered, and, as we say, put into practice; but whether or not it is, or has been, precisely formulated, its chief characteristic is that it is susceptible to precise formulation, although special skill and insight may be required to give it that formulation... 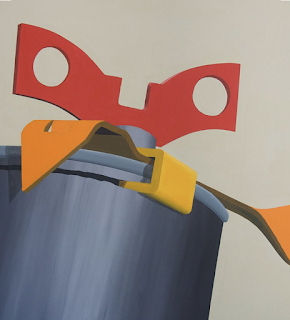 The second sort of knowledge I will call practical, because it exists only in use, is not reflective and (unlike technique) cannot be formulated in rules. This does not mean, however, that it is an esoteric sort of knowledge. It means only that the method by which it may be shared and becomes common knowledge is not the method of formulated doctrine. And if we consider it from this point of view, it would not, I think, be misleading to speak of it as traditional knowledge. In every activity this sort of knowledge is also involved; the mastery of any skill, the pursuit of any concrete activity is impossible without it. These two sorts of knowledge, then, distinguishable but inseparable, are the twin components of the knowledge involved in every concrete human activity... Again, these two sorts of knowledge are involved in any genuinely scientific activity. The natural scientist will certainly make use of the rules of observation and verification that belong to his technique, but these rules remain only one of the components of his knowledge; advance in scientific discovery was never achieved merely by following the rules... Nor, in these arts, is it correct to say that whereas technique will tell a man (for example, a doctor) what to do, it is practice which tells him how to do it–the ‘bed-side manner’, the appreciation of the individual with whom he has to deal. 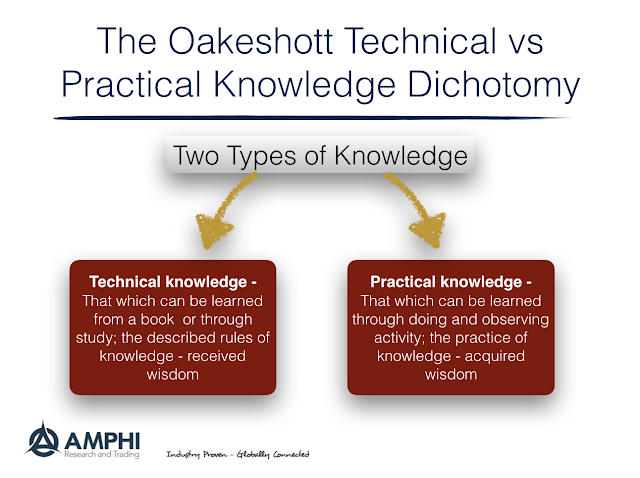 Oakeshott was a skeptic of pure rationalism or at least a significant overweight on technical knowledge relative practical knowledge based on experience and tradition. Uncertainty requires both. While Oakeshott is noted for his political philosophy and conservative views, his thinking focuses on the need for a balance between rationalism and tradition. There should be a desire for pragmatism over pure ideology. Applied to money management, there should be a skepticism against the pure embracing of quantitative investing over a mix that include practical knowledge learned through experience and handed down from through working with doers. This can dichotomy can be seen with discussions on efficient markets. Technical knowledge based on theory would say that trying to beat the market is a fool's game, yet practical knowledge always suggested that looking at the behavior of others and the action in prices made better decisions. To a degree, the practical knowledge that investors make mistakes allowed the development and acceptance of behavioral finance developments. Regardless of our knowledge of corporate finance, the practical knowledge of understanding the personality of the CEO made a difference with investment decisions. Finance has been filled with new ideas based on quant analysis, but their lack of success in the "real world" may force us to scrap or modify based on our practical knowledge. The new HFR bank systematic risk premia indices provide a wealth of information on this growing and important investment area. All alternatives risk premia are not created equal. A review of the return performance over the last year shows that there were clear winners and losers. Across all asset classes, momentum was a big winner over the last year. This is in contrast to managed futures which showed mixed performance over the last 12 months. Value and volatility strategies were down strongly over the last year. In the equity sector, the two biggest losers were low beta strategies and volatility indices. The low beta craze created a crowded trade that turned against investors in early 2018. Interestingly, there was big difference between low beta and low volatility strategies. The volatility premia were hit hard by the volatility shocks in February and have not been able to recover. 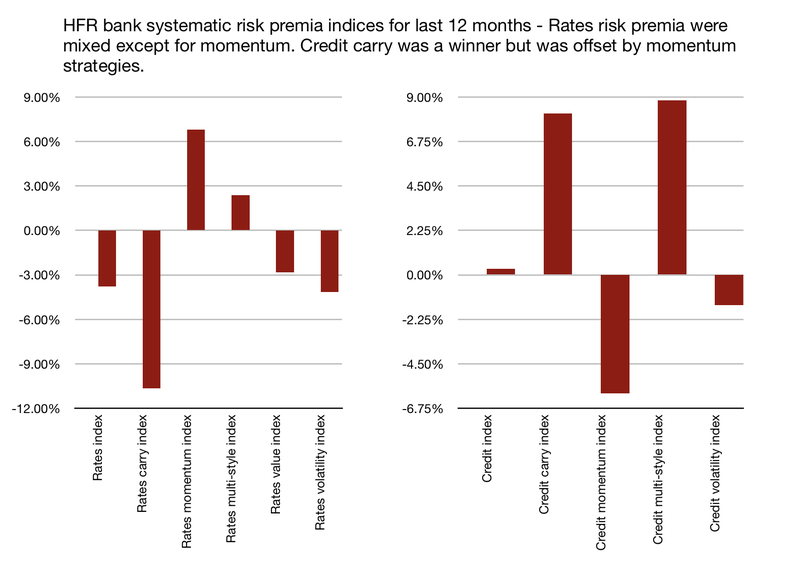 For rates, momentum risk premia strategies were clear winner while carry and volatility underperformed. Credit strategies gained even in the difficult volatility sector. 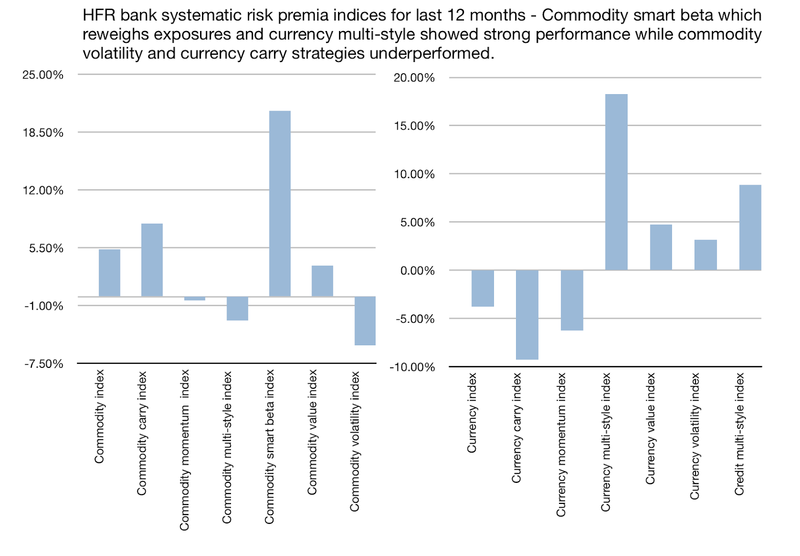 Commodity strategies were generally positive for the last 12 months with smart beta strategies that reweigh market exposures doing especially well. Currency multi-styles gained well over 15 percent on the strong dollar move. Currencies risk premium strategies that focused on carry and momentum underperformed. 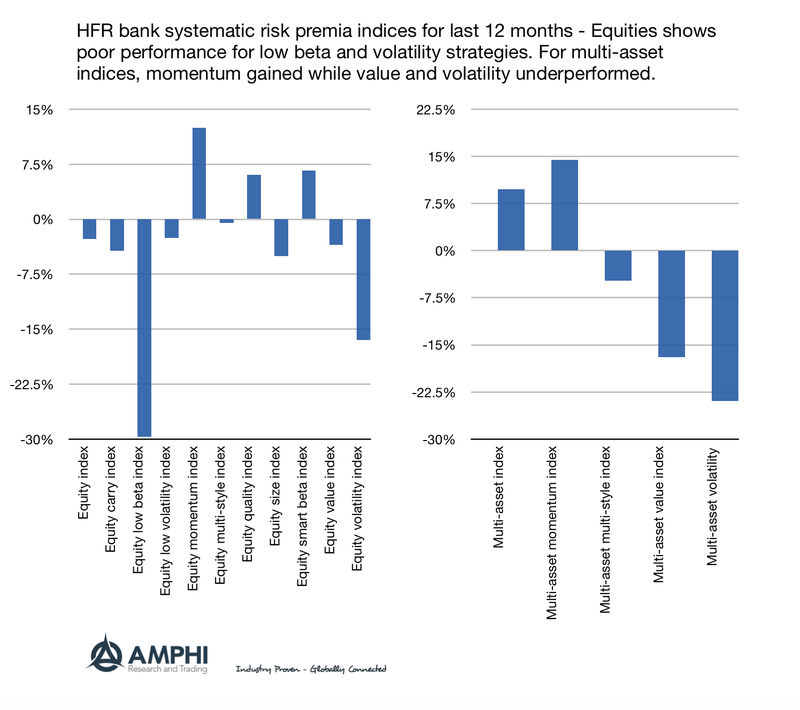 The HFR index information provided shows that there is significant differentiation across asset classes and strategies within the alternative risk premium universe. It is clear that a diversified risk premium strategy is warranted, but selective allocations that account for past performance and the overall macro environment may prove to also be helpful. Bear markets are unavoidable - So what are you going to do about it? How often should you expect equity bear markets? 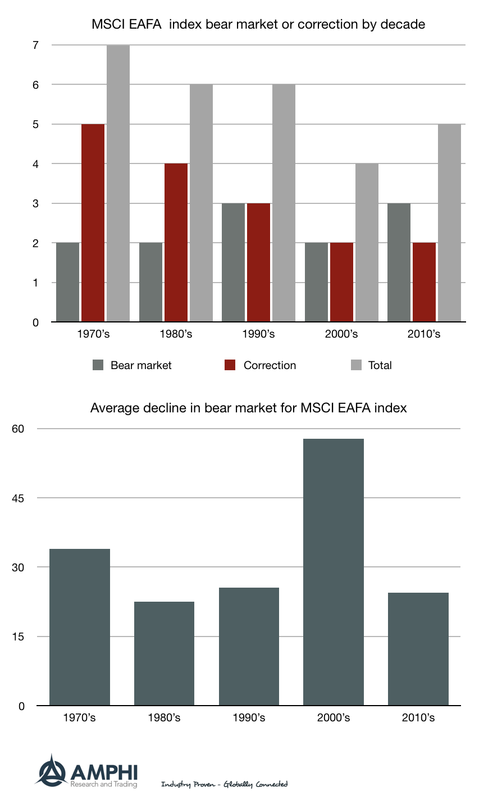 Using the global diversified MSCI EAFA index, we calculated the number of bear markets, moves down greater than 20%, and corrections, move down greater than 10%, since 1970 by decade. (Hat tip to Ben Carlson of "A wealth of Common Sense" for providing the raw data for developing these charts.) The numbers suggest that you will get 2-3 bear markets per decade. The number of corrections or bear markets total 4 to 7. The average decline of the bear markets is variable. The 2000s decade was horrible with two bear markets more than 50%. Bear markets will occur. This is why there is an equity risk premium. We already have had three EAFA bears this decade even with all of the liquidity help from central banks and the recorded low volatility. The answer to these bear markets is simple, diversify; nevertheless, a global diversification strategy for equities will not be enough. There needs to be smart diversification that looks across many asset classes or risk factors. For example momentum/trend-based hedge funds have the significant advantage of going both long and short based on price direction. With this strategy, bear markets can be turned into an opportunity instead of a cost. Strategy diversification does help. We are currently in an EAFA correction, so the portfolio protection solution is all the more important. 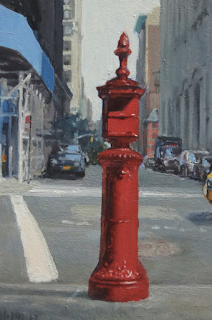 Hold broad exposures across asset classes and strategies.